With freely flowing prosecco and gourmet Hors d’oeuvre, it took little to imagine the luxury lifestyle that residents and guests at Pier 57 will enjoy. The design of the interior spaces is a level one expects at five-star hotels. The sleek fixtures including the stunning kitchens and bathroom mirrors with back lighting made me look twice at the view to remind myself I was not hanging with friends on the Côte d’Azur! Pier 57’s design team has taken great lengths to not only provide the highest quality of finishes but a design that allows for maximum flexibility. The integrated custom cabinetry and appliances are something that we have come to expect in high-end design. But the cunning ability to close off the entire working kitchen and use the stunning marble island with waterfall edge to host your guests for cocktails or dinner is an example of just how much creativity went into these interiors. These clever uses of the interior space will allow residents to use their home as casually or formally as they please and add to the value of calling Pier 57 home. After touring the inside suites and with sunset approaching, the view was calling my name. 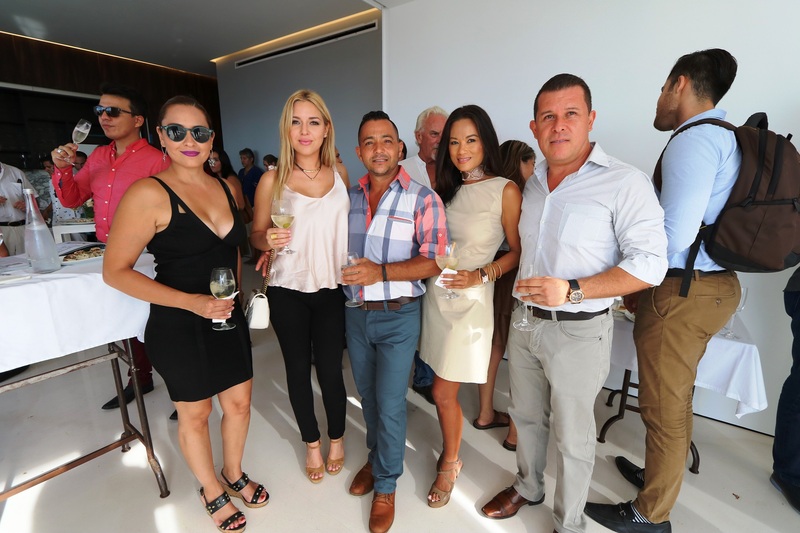 We were fortunate to visit the roof top bar and pool area which the developer believes from their research is the largest private roof top pool in Latin America. It is clear to see the passion that the developer is putting into this project as all the spaces, both shared and private are being completed to a very high standard with the usability for its residents as a primary focus. All of this luxury space is complimented by first class food and beverage service provided in house. I have asked to get the inside scoop as soon as details of which restaurant will be providing this and will let the readers know as soon as I do! The developer Toro Rosso has created an opportunity to live the pacific coast lifestyle that people dream of, and with sales having been brisk reach out to see the spaces sooner than later. For more information on Pier 57, you can contact your local realtor or the team at Tropicasa Realty. Until next time stay cool in our tropical summer!